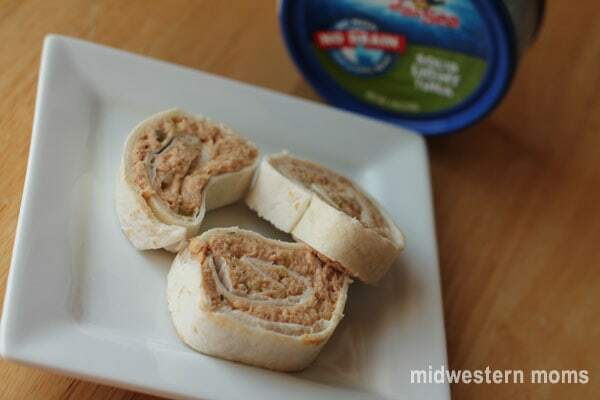 To help Chicken of the Sea celebrate their 60th Birthday, I have used their No-Drain Thai Chili Tuna to create a new twist to the traditional tuna salad recipe and create Thai Chili Tuna Salad Rollups. These rollups are great to eat for lunch, to serve as an appetizer, or to take with you on a picnic. 1. Mix all ingredients in a small bowl except the tortilla. 2. Heat the tortilla in the microwave for 20 seconds to make it softer so it will roll up easier and won’t break. 3. Spread mixture onto tortilla, being careful not to get too close to the edges to avoid it leaking out the edge. 4. Roll up the tortilla and refrigerate until you are ready to serve. 5. Cut into slices and serve. Chicken of the Sea is currently holding the Chicken of the Sea 60s & Sensational Contest, where you can nominate a sensational person who is 60-69 years of age (or enter yourself if you are between those ages). They are offering 4 Grand Prize Winners the chance to choose between 3 birthday packages: a $1,000 shopping spree, a dinner with friends (complete with limo), or a spa package for 2. You can also enter daily for a chance to win some great Chicken of the Sea swag! The contest ends on August 12, 2012, so be sure to stop by and enter! Amanda is a work at home mom and owner/editor of Midwestern Moms. She enjoys reading, crafting and finding great new projects on Pinterest! I stay sensational by staying hydrated and jogging 30 minutes a day. With regular workouts and eating clean – thank you. I stay sensational by spending time on me at least every other day and just allowing myself to relax and be pampered. I also practice yoga and try to eat healthy but I’m guilty of snacking occasionally. I started working out and doing cardio every other day for 30 minutes. I try to stay sensational by drinking lots of water and getting enough sleep. I drink lots of water! I bake all kinds of goodies from cake to cookies. I love baking for others. get a bunch of sleep and exercise a lot. I work hard on my farm everyday. I stay sensational by smiling and laughing all of the time. I stay sensational by keeping a good sense of humor with 2 babies under 13 months! Thank you for the lovely giveaway! smile every chance i get. I try to drink tons of water throughout the day to stay sensational. Keeping my sense of humor. I eat tune and lots of fruits and veggies. My husband and I try to walk around the neighborhood at least 3 times a week! I try to keep a positive attitude. I eat fish 3 times a week, walk and do regular exercise and thank Jesus. I exercise regularly and take care of myself. Lots of sleep and confidence. I try to take for myself, hot bath, going to get my nails done. I drink a lot of water, get as much sleep as I can and eat a lot of fruits and vegetables.